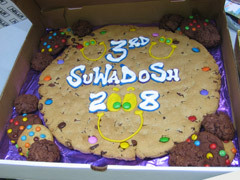 Early morning rain gave way to sunny skies, and the 3rd annual SuWaDoSh potluck picnic on July 13 was another gourmet and social success. Food donations by Shoppers Drug Mart (buns, condiments), Frito/Lay (chips) and the Cookie Store augmented the potluck delicacies. Approximately 60 attendees enjoyed this event. 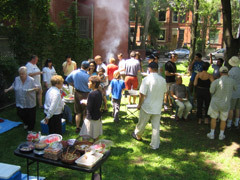 The Trefann Association raised $215 through the very generous donation of raffle prizes by these neighbourhood businesses and by local residents: Bousada, Capital C, Contech, Dominion on Queen, Gowlings (law firm), KA Jewellry, Kids Inc, Nella Cutlery, Pete’s Open Kitchen, Rivertowne Deli, Savoury Grounds, StreetCar Developments, Sweet Marie Variety, and Shani Mootoo. 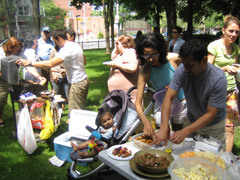 A big thank-you to picnic organizer Jennifer, and her team of volunteers.